Sun Valley. But now that it is summer again in the mountains I can't wait to get my bike ready for some trail riding. 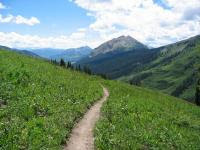 If you are looking for a great bike shop in Breckenridge, Colorado try Great Adventure Sports and join us in the help to build the Swan Mountain Recpath around Lake Dillon.